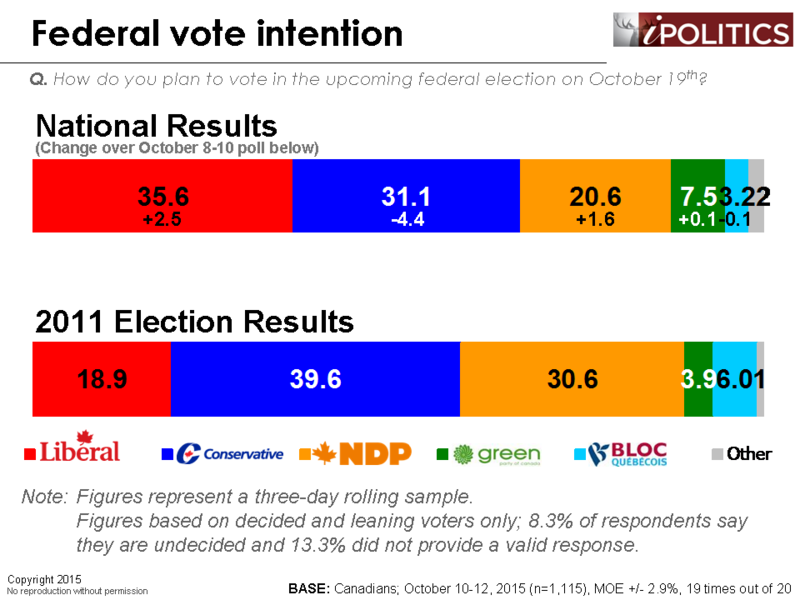 [Ottawa – October 13, 2015] As we enter the final week of the campaign, the Liberals now hold a significant lead. The Conservatives, meanwhile, have had a significant drop which, if confirmed tomorrow, could spell the end of their pursuit of a stable government. The NDP has stopped its bleeding and may be rebounding slightly and, although their standing on vote intention has been greatly diminished in recent weeks, the distribution of their support is fairly seat efficient. The Liberal Party has made sizeable gains in both Ontario and Quebec. The Liberals now hold a noticeable lead in Ontario and they find themselves tied with the NDP for the lead in Quebec. While the smaller sample sizes at the regional level preclude a more definitive analysis at this stage, there are signs that the Conservative strength in Quebec is beginning to wane and the party now sits in a distant third place. The Bloc Québécois is at just 14 points in Quebec and is becoming less and less of a force in this election. The Green Party is at 19 points in British Columbia and could offer up some surprises in on Monday. 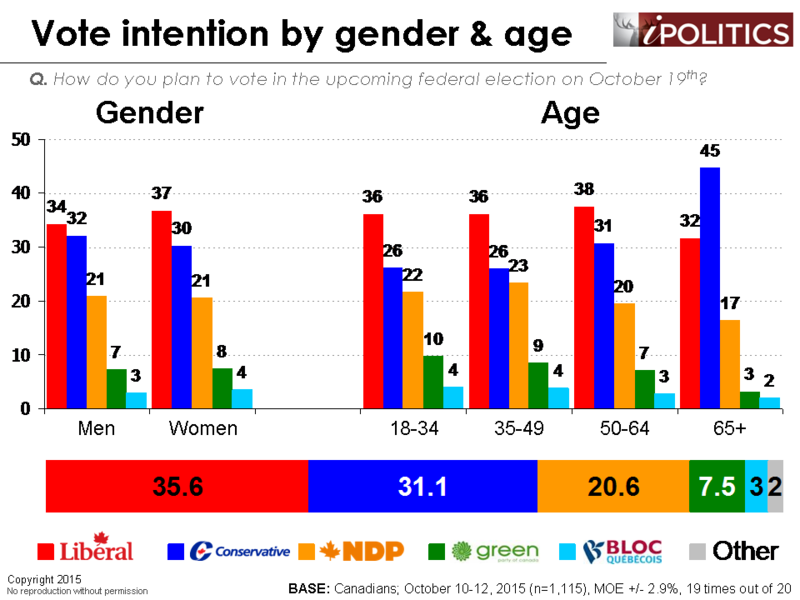 The Conservative vote is still very heavily concentrated among seniors, while the Liberals are now doing well with all the age groups under 65 and they have a huge and important advantage with the university-educated. If these trends are confirmed tomorrow, it may be that Stephen Harper’s aspirations for a fourth mandate will be dashed. The figures in this report are based on a three-day rolling sample. Each day, a new day’s worth of interviewing is added and the oldest day is dropped. The field dates for this survey are October 10-12, 2015. * In total, a random sample of 1,115 Canadian adults aged 18 and over responded to the survey (939 by HD-IVR, 176 by live interviewer). The margin of error associated with the total sample is +/- 2.9 percentage points, 19 times out of 20. Ian I think they are catching up to the current trend, Ipsos-Reid also agrees with the other polls. Why? Is it his hatred of science? His disdain for democracy? His constant negative advertising even outside the election? His weak economic growth? His mean spirit? It looks like people are getting strategic in their approach, and the 65-70% who want him gone will finally have their way. Yay. I suppose there’s not a whit of negativity in that comment or in the Liberal/NDP campaigns… Sometimes a moment of reflection allows one to see that what on it projecting on others shows more one’s own insecurity. PM Harper doesn’t hate science, he has stood up for democratic governments around the world (e.g., Ukraine against Russia, Israel against Iran, etc.). The notion that his advertising (e.g., “Just Not Ready”) is unduly negative ignores the barrage of accusations of “dictator”, “contemptible”, “mean-spirited”, etc. and worse that has been thrown at him. If Canadians choose to replace him, he’ll still go into the history books as a PM who lowered taxes, managed our finances well, quelled the perpetual national unity crises that characterized Liberal governments (remember separatism? ), apologized to First Nations Canadians for residential school abuses under past Liberal governments and apologized to the Japanese and Chinese Canadians for the intolerance shown them by past Liberal governments. Finally, he kept us secure. Not a bad record. To reasonable people, it’s one that would merit another four years. We’ll see what happens next week. All of the claims made by Bruce are very easily verified. Harper has gutted the staff and budgets of numerous scientific departments. He and his party have been found guilty of election fraud multiple times, and have hamstrung Election Canada’s ability to do their job (to the degree that we now have international observers in Ottawa to monitor the election, as if we were some emerging democracy. Does that not embarrass you??). He was running a campaign based on the economy, but when he didn’t like the poll results (because, really, the economic record simply doesn’t support that he’s managing the economy well) he hired an Australian fear monger to manage things. If the xenophobic results of that don’t cover the mean spirited and negative aspects, then you and I will likely not agree on much. Great comment… thank you, I agree and I applaud you! How is it someone can so confidently say something that is the polar opposite of reality? We went from a government that balanced the budget and paid down the debt to a government that is borrowing heavily, and for what? If Martin had been the PM these past 9 years instead of Harper, our debt would probably be billions less than it was before Harper took over. How can you possibly believe that this is a government that ‘managed our finances well’? He has mismanaged the environment, screwed over the hard work the Chretien government put in to fix the debt for no good reason whatsoever, and you think we need another 4 years of this crap? What he has done to Canada is sickening. I don’t know how long it will take to repair the damage. Nanos, Forum, Ekos and Leger. 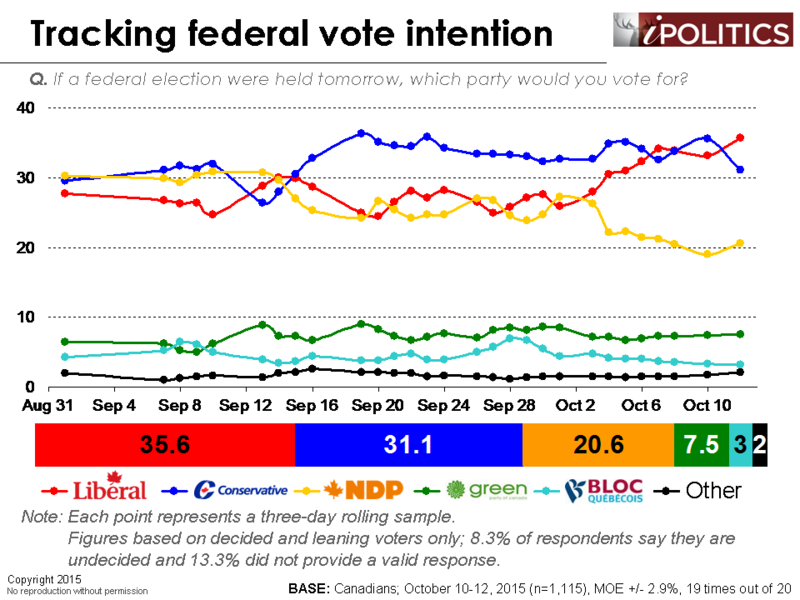 Waiting to see if Angus Reid and Mainstreet’s news polls show the same trends. 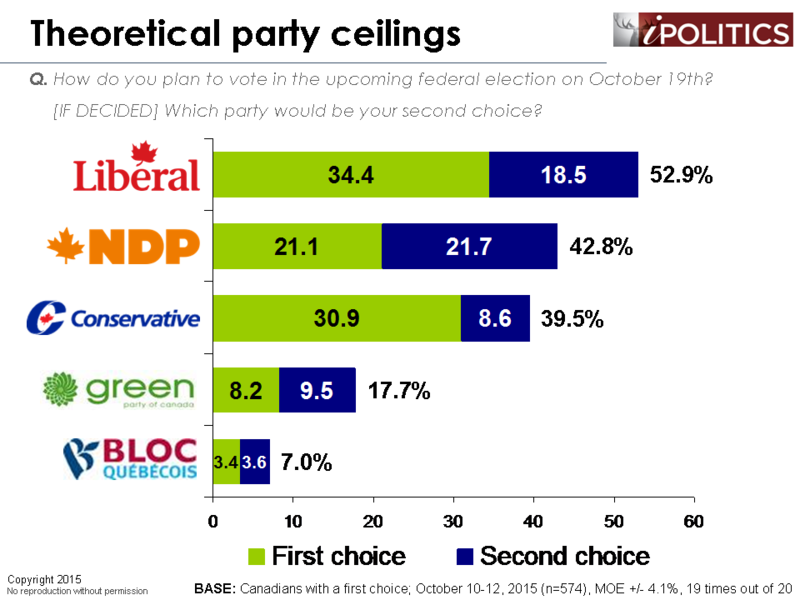 I find it very interesting that the LPC is now leading in BC , Man, and QC. Coming from Ontario I felt that the Red Tories would start stampeding away from Harper like they ran from Hudac. Well we have certainly witnessed the carnage that this has done to Ontario. The AXIS OF TAXES will destroy any hope for Ontario to ever recover economically. 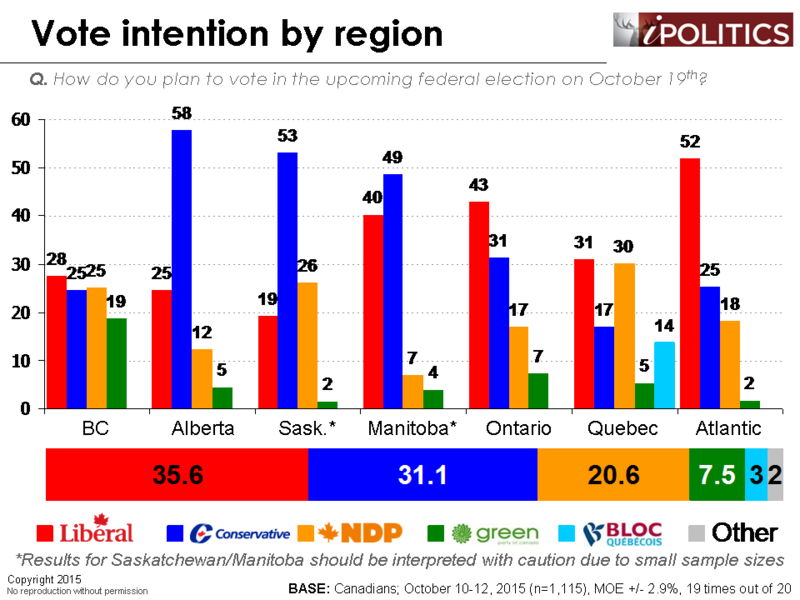 Funny, how I had pointed out at the last published poll how the numbers for Manitoba, Ontario and Quebec are totally out of whack by about 10% and look at this one, it’s right there now. Your post says it all! Completely agree! If for 3 1/2 years you only consider 30% of the electoral important to you,how do you expect that in 80 days you can get almost 10% to suddenly want to help you out. By the way is circumcision a barbaric cultural practice? Excellent point. I always thought the Conservatives had a weird strategy. It makes me very proud to witness the compassion of many fellow citizens whom are ousting the current government. I was so hoping people would realize that negative division of our lovely multicultural society won’t be tolerated. Peaceful solutions to our problems with extremists and finally taxing the wealthy instead of tax breaks will be wonderful. Disallowing overseas tax shelters for wealthy corporations and making them pay their fair share of our tax burdens will be new and exciting. Good for you all. Finally this oppressive government is being shown the door. …and act II will be a “progressive” Trust Fund baby also with a regressive totalitarian regime, dictating to Canadians what our “opinions” should be. I feel that under any other PM Canada’s influence in the world will be lost. What is with the massive variation in green vote in BC? 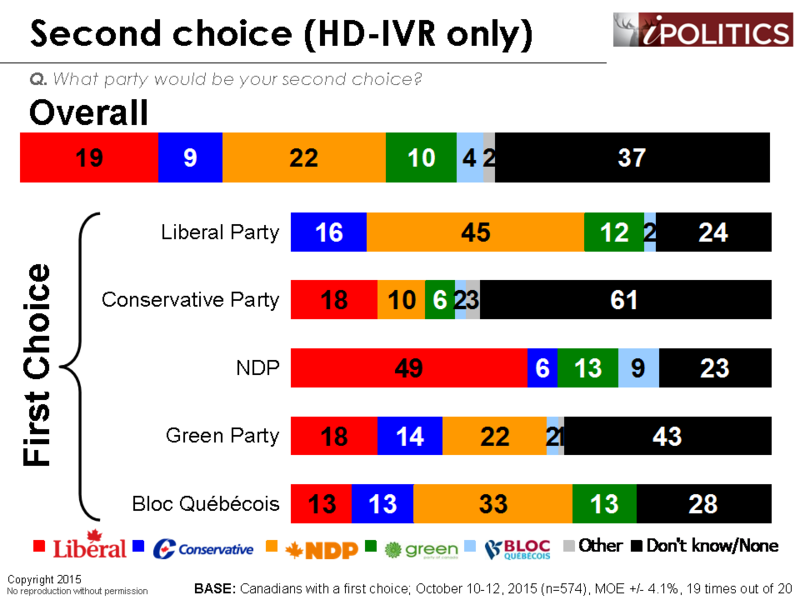 EKOS has Greens at 19%, Ipsos/Reid at 3%. That is pretty considerable even for regional data. Will be interesting to see which is closer to the mark. The polls are not in agreement at all on regional trends. I will not be surprised if Harper repeats the feat pulled off by David Cameron in the U.K.’s most recent national election. Like Harper, Cameron was vilified by the mainstream media and the opposition and was either trailing or at best even in the polls. Cameron’s Conservatives stunned the pollsters and their opponents by winning a majority. They beat Labour by 98 seats. Given that atrocious track record of recent polling in provincial elections – two wild misses in Alberta and one in B.C., I don’t think that we should give the polls any credibility. I will not be surprised at all to see the Conservatives win on October 19. If they do, perhaps all the pollsters should pack up shop for good. Cameron’s victory in England was fueled by the total disarray of the Labour Party, their stupid deal with Tories to try to sink the Scottish party in the North, and the kiss of death by Tony Blair. Nothing resembling this is afflicting either the Liberals or the NDP, but the NDP have lost momentum in Ontario, and this is likely to result in a swing to the Liberals in Quebec, by those who want to be part of the next governing party. Harper is toasted, and he did it to himself and the Conservative Party. Let’s hope the Progressives are able to bring the Conservative Party back to its traditional constructive role in the near future. Even a name change would help. Despite the polls and the generally optimistic feeling of the majority of Canadians do not take anything for granted. In every election Harper has been involved in the Conservatives have been guilty of electoral fraud (In / Out funding, Robo calls, Overspending electoral limits, and more). Harper has shown that he will do ANYTHING to maintain power. There is no doubt he will try something in this election as well. Even more votes are required to ensure he does not get away with it. That sounds like wishful thinking and i think everyone would be surprised if harper pulled off a ‘David Cameron’. Harper is quote a polarising figure … people either love him or hate him. There isn’t much in between. And i would hardly say he is ‘vilified’ by mainstream media … unless you don’t consider the national post, sun media and the globe and mail to be ‘mainstream’. Polls may miss the mark sometimes but by and large they are pretty accurate .. or there wouldn’t be a market for them. Two polls the day before the election actually called the conservative win by 6%(survation and survey monkey). When you have a margin of error of +/- 2 in a first part the post system it can lead to some pretty massive swings and seat changes. Consider that Cameron won only 6% more of the vote but took about 40% more seats. But i guess we will see in a few days! I believe you are describing the left. The left has no interest at all when someone tries to infuse critical thought into any of your arguments. You are censured through ridicule if you fail to subscribe to the dogmatic opinions of liberals and progressives. It always astounds me when Conservatives give a description of themselves and then attribute it to Progressives. It must take a lot of effort to keep your mind that tightly closed. The rise of the LPC in Quebec may not be fully matched by a corresponding rise in terms of seats. That rise could be partly attributable to the fact that the non-francophones who may have flirted with the NDP go back to the LPC. Given that the non-francophones are concentrated in a lesser number of seats; this phenomenon may not be correspondingly reflected in number of seats. Nevertheless, the LPC probably still progressed among the francophones since the last election. Both phenomena will certainly mean an increase of seats for the LPC as compared to 2011 in Quebec – but the LPC cannot even think about the plurality of seats in Quebec, even if close to first in number of votes. Please people, don’t let the Liberals take power, currently in Ontario the people pay one Billion dollars per month in interest alone, we don’t need any more debt, we’ll just be passing it to our kids to deal with in the future. ANY PARTY BUT LIBERAL! safety regulations ( food and transportation) tax breaks for the very wealthy, big write offs for major companies, which means the general public is footing the bill and although we are getting reduced income tax rates, the non-refundable tax credits are being reduced hence we pay more taxes. with everyone in business and govt — automating everything — job prospects look very bleak. is there any hope? If you follow main stream media you will notice every possibly negative thing that can be dug up is printed about conservatives and they rarely print negative things about the other parties…which there are many….liberal senators being investigated for example. You know pollster constantly changing their methodologies is really very frustrating to those of us who pay attention. You write an article last weekend saying your live interview results favour the Liberals and then you don’t do live interviews for two days over the weekend. When declaring that the Liberals have pulled into the lead you fail to mention this in your current analysis. With polling as unreliable as it is constantly changing your methods doesn’t help. Curious why EKOS keeps showing Green support approaching 7% when the rest of the country has them around 4 to 5%? The Liberal election co-chairman resigns under a cloud of scandal, and the main stream media barely pays lip service. Imagine if it happened to the Conservatives it would have the top story till election day and beyond. A world wide recession. A world drop of oil pricing. Two extremely serious problems. Both happened during the pc reign. Neither where caused by Harper or the pc’s. I believe that they have led Canada quite well considering. Yes, they are not perfect. neither was the last liberal government. Actually they were probably the most corrupt government Canada has ever seen. Unfortunately the two provinces that will decide our new government are “have not” provinces being supported by 2 or 3 resource rich (smaller population) provinces. Everyone get out and Vote. You’re calling the Liberals the most corrupt gov’t Canada has seen??? Have you been out of the country for the past decade?…or just not paying attention? Harper is hell bent on destroying our country as fast as possible; it will take years to repair and rebuild Canada to its former glory. That’s right, everyone get out and vote this treasonous thug out.